We spent over 30 hours researching and testing 12 different hamster cages and found that ease of assembly, size, and durability were most important. The Lixit Animal Care Hamster Cage scored high marks in all categories making it our top pick. The hamsters were very happy in this roomy cage that offered them plenty of space and ventilation. The metal shelf and exercise wheel provided the animals with exercise and activities. It also comes with a food bowl and water bottle. This hamster cage is colorful and very durable and will keep your hamster safe, comfortable, and happy. If you have small animals of any kind, you need a good quality cage for them to live in. Hamsters are entertaining little animals that are perfect for older children, especially those in the 8 to 12 year old range. Since there are so many different types of hamster cages on the market, it’s beneficial to you to know some things about them before you decide to purchase one. Since hamsters will spend the majority of their time in their cages, so it’s important to make sure that the hamster cage you choose has plenty of room, space for the hamster to play and sleep as well as explore and eat. These top rated hamster cages are some of the most popular on the market and are clear customer favorites for many reasons that we’ll share with you below. If you know what to look for you’ll be able to choose the hamster cage that your hamsters will love calling home. The Lixit is the best habitat for hamster simply because it is the most humane with regard to space. It safely houses your hamster is very well ventilated. It’s cage is close together and is appropriate for hamsters and mice. It easily assembles and comes with a metal wire platform an exercise wheel big enough for a Syrian hamster and drinking bottle along with a feeding bowl. It’s durable layout and design ensures to keep your hamster safe and doesn’t get bored. You need at least 360 square inches of floor space for a Syrian hamster and 288 square inches less for different dwarf breeds. This is important for the overall health of your hamster. This cage meets both of those requirements. Here is a customer picture of their cage that they used for their Sryian hamster. They removed the wire platform and added their own. Habitrail has been around for decades and is a household name when it comes to hamster cages. This OVO habitat is conveniently compatible with all other habitrail products and uses the Habitrail mini trails tubing which encourage the hamsters to explore further. It’s easy to assemble and easy to clean as well. Children will love watching their pets go through the trails and move throughout their cage. You will have all you need to provide a comfortable and entertaining home for your hamster, gerbil or mouse. The Habitrail OVO hamster cage can be expanded easily to make it as large or small as you want. Expand the cage for several hamsters or keep it smaller if you only have one. Whichever you decide, the brightly colored plastic and unique, almost space-like design will delight your kids and the hamsters too. 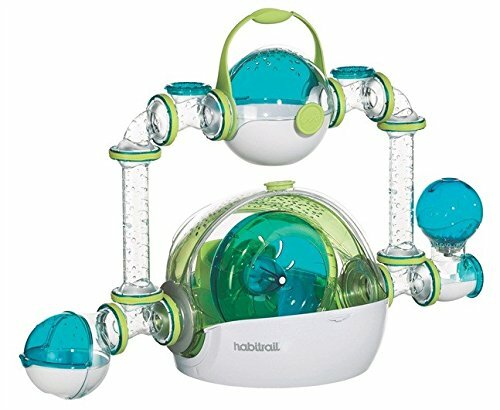 Your hamster will enjoy plenty of tubes, elbows, and windows as well as a Habitrail den, a transport unit, retractable roof, green and turquoise wheel, stairs, a hideaway for privacy and a feed dish and water bottle as well. 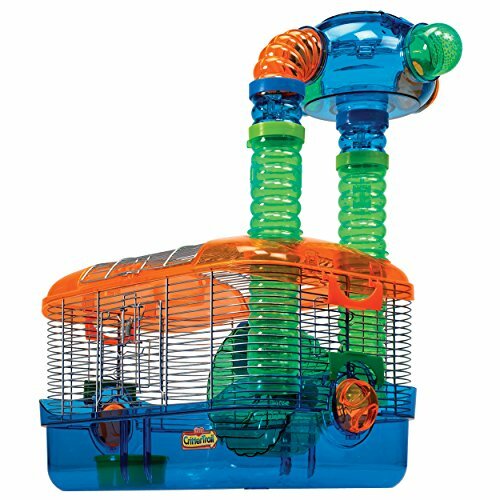 With Kaytee’s CritterTrail Triple Play, your hamster will feel like they live in a mansion. There are three different environments that hamsters get to enjoy with this terrific, brightly colored customer favorite. You can create tunnels, towers or arches for them to explore and exercise in. Secure, wire door locks are spring loaded and help ensure your pet is completely safe. The different layouts that you can use with the Kaytee Crittertrail help keep your pet mentally challenged and physically in fit as well. You can even change designs to provide more muscular development and exercise for your pet. The doors are on the front and top and make accessing your pet very easy. This is the perfect hamster cage that can be used for hamsters, gerbils, mice and dwarf hamsters. Along with a great habitat, you have a wheel, feed dish and water bottle for your pet, providing you with everything you will need to ensure they have the maximum comfort. Assembly is easy and clean up is super simple as well, making it a great choice for kids that want to have a pet of their own. Here is another great product from Habitrail. 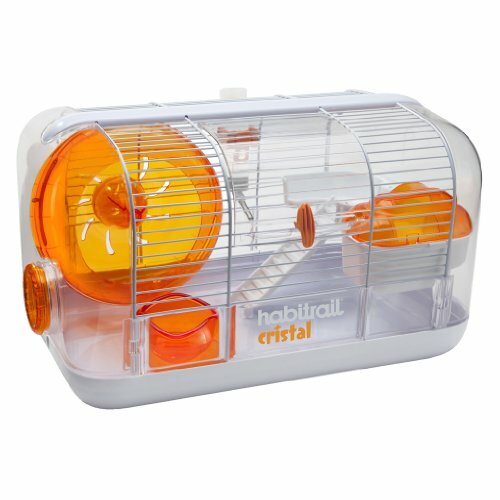 The Habitrail Cristal hamster cage is designed to give your hamster plenty of air circulation and comfort. It easily connects to any of the other Habitrail products with the Lock Connectors that you can purchase separately. You can keep it small or expand it as large as you want if you have several hamsters. The large door is made of strong plastic and makes accessing your pet or refilling food and water dishes easy and convenient. The door locks to keep your pet safely inside and away from any harm. The fun look out deck and ladder and exercise wheel gives your hamster plenty of ways to exercise and it’s good for their mental stimulation as well. The litter guard help keeps the litter inside lessening any messes and making clean up super easy. You also get a chew resistant water bottle and food dish too so you will have all you need to provide a comfortable, safe and exciting home for your hamster. When you have hamsters, gerbils or mice you want to provide the best habitat you can for them that include things to do and places to climb and hide. All three of these top rated hamster cages provide hours of entertainment for your kids as they watch the animals move about and also provides a perfect home for the hamster to play, sleep, eat and relax. Each top rated hamster cage has its benefits, so knowing what your needs are before you choose will make your decision much easier. Do you want a cage that can be expanded? So you want one that has a lot of tubes and levels? No matter what you decide, any one of these top rated hamster cages will fit the bill. Below we have provided a detailed buyer’s guide that will give you even more information about how to choose the perfect hamster cage for your hamsters. With the right information under your belt, you can easily navigate through the many styles and choices and decide on the one that will be the best fit for your pet’s needs and your preferences. What is a Hamster Cage? Hamsters are popular pets with people everywhere. They are soft, can be cuddly when raised with a lot of socialization and provide hours of entertainment for their owners. Having the right habitat for these cute pets is very important for their health and well being. A great home environment means they will be healthy, happy, and energetic and give you and/or your children the opportunity to have a pet that is truly enjoyable to watch and take care of. Their ability to progress and grow properly is determined by the type of environment you provide for them. There are many different types of hamster cages on the market today. The only one who knows what your needs are and what type of cage will best suit those needs is you. With the right information, which we have provided below, you can choose a great hamster cage for your pet that will enable them to be the healthiest they can be. When you begin your search for the hamster cage that provides the best environment for your pet, there are several things that you can consider and compare. These considerations will help you narrow down the choices and find the one that is perfect for your pet. Plenty of Ventilation – Fresh air is important for any animal, but especially so for caged animals. Because many hamster cages are made of plastic, it is important to ensure that ventilation has been accounted for. 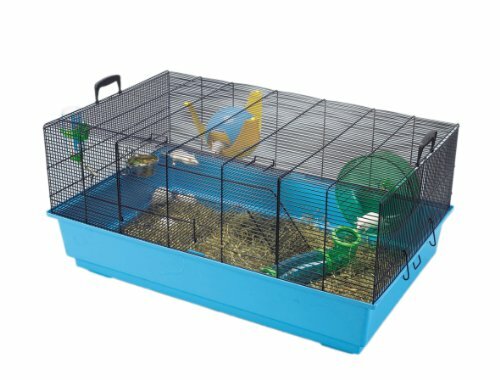 Several styles of hamster cages, despite being plastic, have addressed this ventilation issue and provided proper ventilation for the hamsters in the design of the cage. Style Choices – One thing is certain when it comes to hamster cages and that is that you have a lot of different styles to choose from. Most are made of plastic, wire and even aquariums with a wire mesh lid. Each style has its pros and cons. The type of hamster you have can play a part in deciding which cage style is best. Cage Sizes – When you are shopping for hamster cages, size is an important consideration. Factors such as how many hamsters you have or will have and what type of hamster they are can determine which cage size is the best. You don’t want to cram several hamsters into a small cage. That can make them irritable and aggressive. Easy to Keep Clean – One of the facts about hamster cages is that they need to be cleaned on a regular basis to keep your pets healthy and happy. If the cage is difficult to clean, it can be easy to avoid doing it which in turn creates unwanted problems such as odor and unhappy pets. While modular style hamster cages such as Habitrail are always so popular, make sure they can be cleaned easily or they will quickly lose their appeal. Safety Features – If there is a place for the hamster to escape from their cage, they will. Safety features such as not too much spacing between the wires and locking doors. These safety features are especially important when you have other pets in the home. Exercise Wheels – Hamster exercise wheels are a recommended staple for any hamster owner. They provide a lot of exercise for your little furry pet. Make sure that the exercise wheels that come in your cage or that you purchase don’t have cross bars or any place that they can get their heads or legs stuck and injured. Provide Plenty of Horizontal Space – Although hamsters love to climb, it is important that their cage provides them with plenty of horizontal space. You also want to be sure that there aren’t any areas where the hamster can take a long vertical fall. They are great climbers…up the cage but climbing down has its pitfalls and they tend to just drop down to the bottom rather than crawling or climbing. They will appreciate cages that have more floor space side to side rather than up and down. Wire Hamster Cages – There are many pros to having a wire hamster cage. In addition to allowing easy access to your hamster, ventilation is never a problem with this style of cage. They are not as expensive as the plastic, modular style of cage and are easy to find. Hamsters usually enjoy climbing on the wires of their cages so the cage frame itself becomes a playground of sorts. Although there is really no way to stop it, one of the negative things about wire cages is that they can become “chew toys” for their inhabitants. Chewing on the wires of the cages can break their teeth and possibly cause other injuries from falling. If the bars are too far apart, limbs can get stuck between the wires as well. Although ventilation is not a problem, the opposite issue can occur which is too much draft especially in the colder months. Prevent drafty areas in your pet’s cage to keep them from becoming ill. Plastic Hamster Cages – When children think of getting hamsters or gerbils the thought almost automatically goes to the famous Habitrail design of tubes and areas of climbing and traveling fun for your hamster. They are still popular and the design has had some improvements that have increased its appeal with customers. The bright colors and interesting designs are probably more appealing to the children looking at them than the hamsters themselves, but these types of cages are still frequently purchased. They provide a great way for young children to watch their pet interact and exercise without having to handle them, perfect for young children that are not quite ready to handle the pet often. A few of the things that are not as appealing about the plastic cages is that they have much less ventilation unless they have been specifically designed to allow for increased ventilation and they can also be more difficult to clean. In addition if you want to interact with your hamster and they don’t feel like it, it is much harder to reach them if they are hiding in one of the many loops and tubes. Aquarium Hamster Cages – Aquariums are probably the easiest type of cage to buy but out of the three, it would be the least preferable. Although you can see your hamster through the glass, ventilation of any kind is severely limited. They do prevent any chance of the hamster escaping since they can’t chew through glass, but it also doesn’t provide much in the way of exercise and variety for your pet. Many people like the simplicity of the aquarium hamster cage, but keep in mind that it will need additional toys in the cage to allow for the lack of climbing apparatus. Watching your hamster in a glass aquarium is easy, but they are not that easy to keep clean. Despite that fact, the cage still needs to be cleaned thoroughly on a regular basis or health problems and bad odors from the dirty cage can become a real problem. Hamsters are very engaging and entertaining pets and the cage you purchase for them can be a great, safe way for children and others to watch them go about their business without disturbing or potentially harming the hamster. When looking for the right cage for your furry little pet, look for one that is age appropriate if your children are the primary caregiver. With all of the options available you can really choose one that is tailored to what your child/children want to see their pet to and the level of interactive care they can do at their respective ages. The top rated hamster cages we reviewed above are some of the most well made and well loved cages from a customer standpoint. Each one is unique but all of them provide hamsters with healthy, large, interesting homes that they can live their lives in.